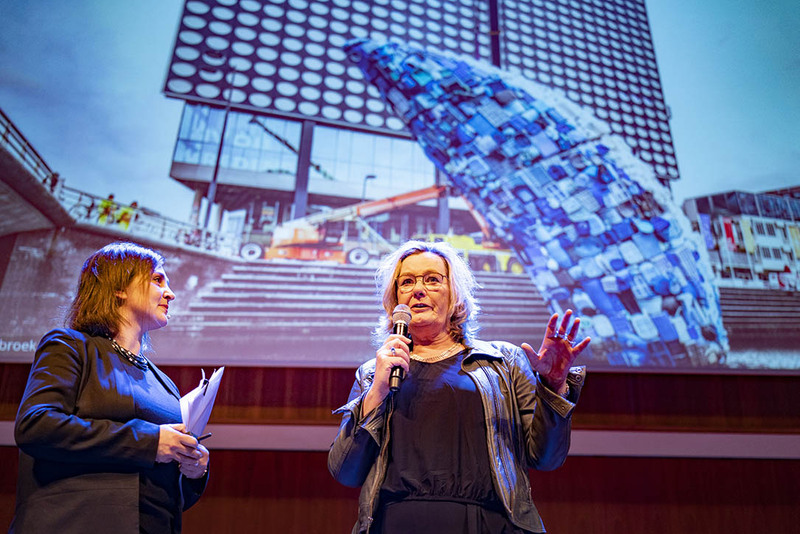 With the plastic ‘Skyscraper’ whale towering from the ice in the canal next to TivoliVredenburg, inside a vibrant and collegial Pathways to Sustainability conference took place. 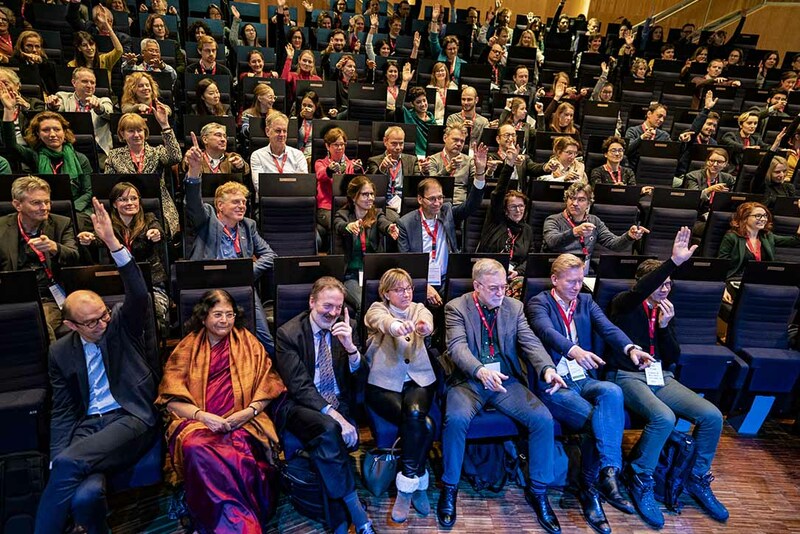 Almost 500 participants listened to keynotes varying from a memorable speech by Diederik Samsom to a more reflective take on the sustainability challenge by Harvard Professor Sheila Jasanoff. The afternoon break-out sessions showed engaging conversations over various sustainability challenges. During the final panel discussion several experts debated how the university needs to change to really live up to today’s sustainability challenge. 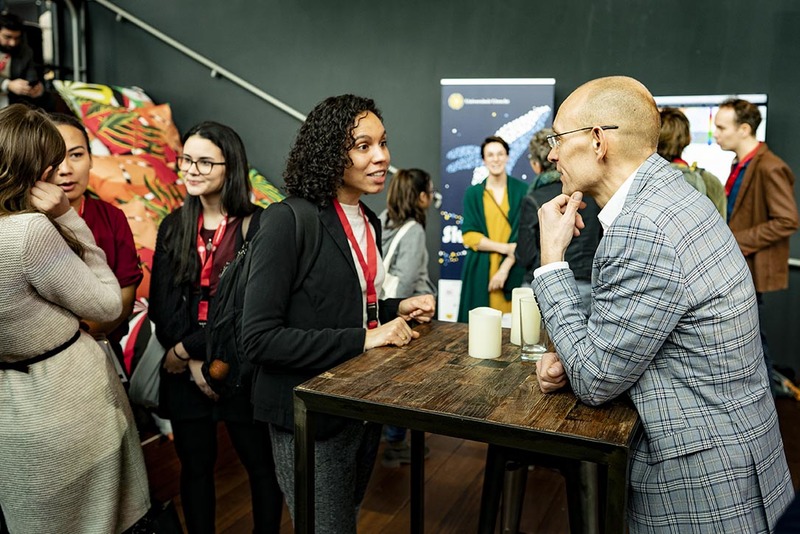 Almost 500 participants, some 55% from within the university, and 45% from other universities, ministries, business or NGOs, were warmly welcomed by Dr Vanessa Timmer and Prof Marleen van Rijswick. Prof Maarten Hajer and Rector Henk Kummeling continued the programme. “It may sound paradoxical, but our research shows adding complexity can bring solutions closer”, said Hajer. 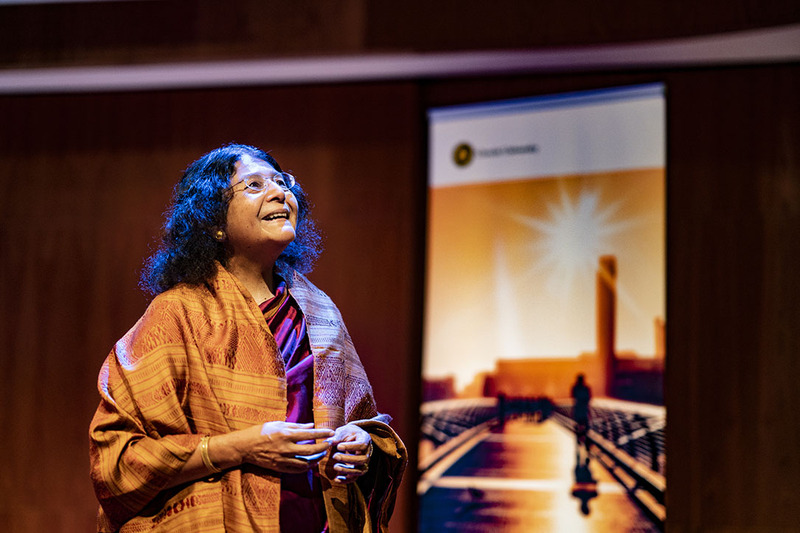 The first keynote speaker Prof Sheila Jasanoff is seen as one of the key intellectuals in the ‘Science and Technology Studies’ tradition, which she co-founded. She warned that we take the categories of thought for granted, too easily. Most scientific terms, even a seemingly neutral term like CO2 is loaded with political meaning. It is only through a deep interdisciplinary collaboration that we can avoid falling into the trap of being political without us realising it. The second keynote speech was held by founder of the Green Protein Alliance Jeroen Willemsen. Using his innovative vegetarian ‘meat’ as an example, Willemsen showed how innovative researchers, companies, and investors worldwide are leading the quest for new concepts and businesses models for plant-based protein. But how can we best urge consumers and producers to produce and consume more plant-based proteins? 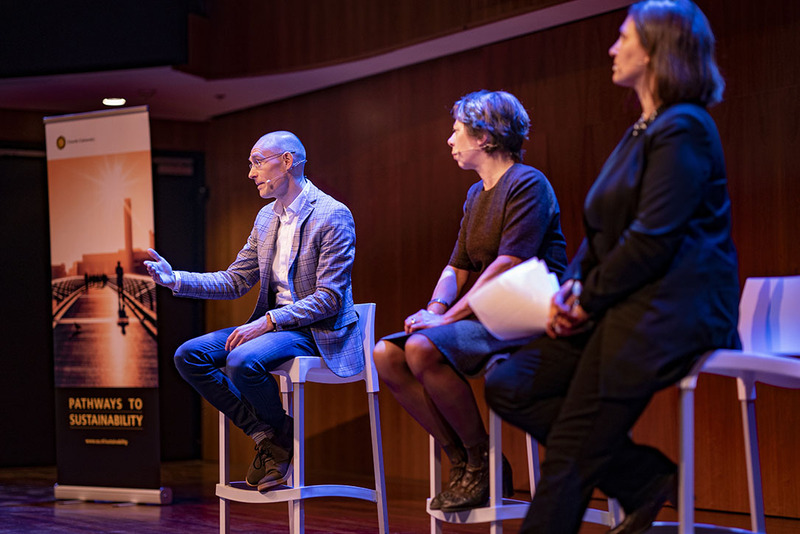 Nudging expert Prof Denise de Ridder reflected on his presentation in an on-stage discussion. Video: what do the participants take home from the conference? The last eye-opening speech was held by Diederik Samsom, chair of the Klimaattafel Gebouwde Omgeving and former politician. Samsom used the narrative of Thea Beckman’s book ‘Children of Mother Earth’ and his recollection of the sinking of the ‘Rainbow Warrior’, the Greenpeace ship, to explain his political motivation to work on the sustainability transition. In his speech, that came straight from the heart, Samsom dared to dream big, and was optimistic, just as Jeroen Willemsen before him. After Samsom’s energising talk moderator Vanessa Timmer encouraged all participants to search for unfamiliar people and to start a conversation over lunch. This worked of course, but during the vegan lunch the general ambiance was amicable and the most overheard sentences were ‘Haven’t seen you in a while’, ‘How are you doing?’ and ‘But have you met my colleague already?’. Confirming that the sustainability community is solid but yet still expanding. While enjoying the delicious vegan sandwiches participants had the possibility to attend a live talk show on diversity in education. All talk show participants agreed that it is, without a doubt, necessary to diversify the student population. At the same time we have to make sure we offer every single student meaningful education, and we have to give them the right tools to pursue their goals after graduation. At 2 o’clock all 500 participants split up into six different break-out sessions. During these sessions they could discuss sustainability challenges in more detail. 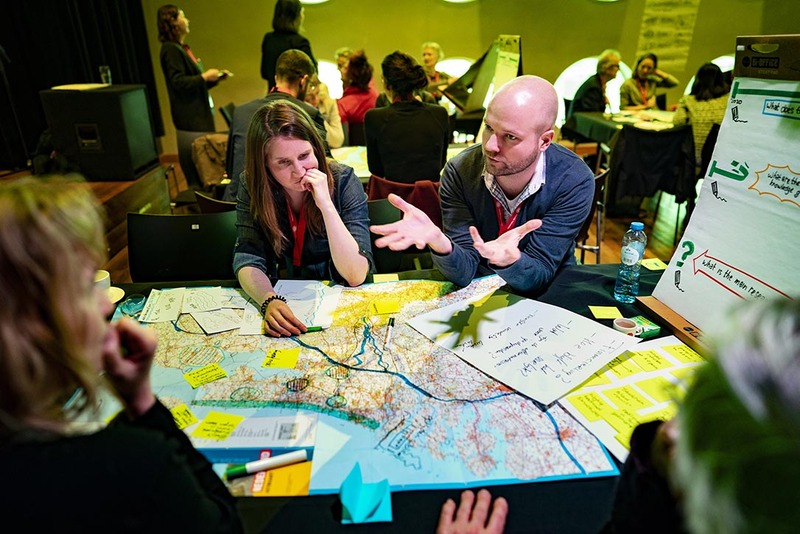 Participants were challenged to come up with their boldest step to create fully circular cities. Others attended a heated panel discussion about decarbonising the industry. A third group had to roll up their sleeves and tried to imagine how our Dutch delta looks in the future. What pathways should we walk to get there? 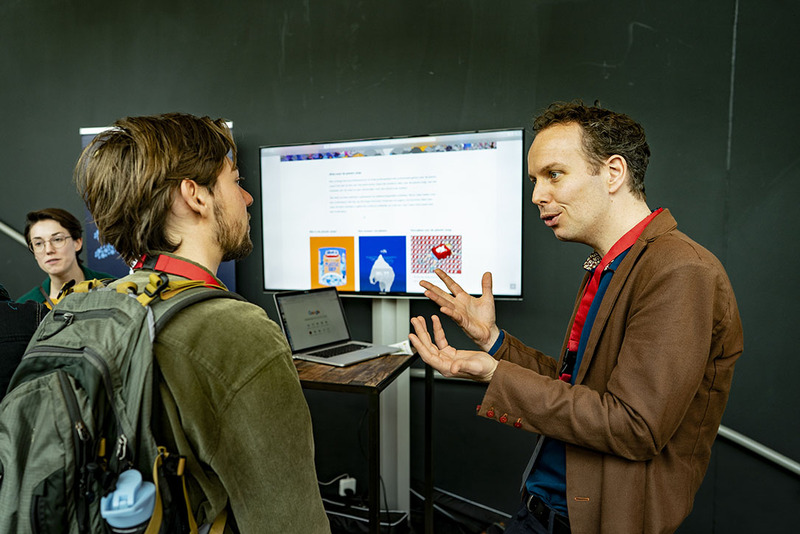 During another session plans were made on how to optimally use the Utrecht Science Park campus as a living lab where researchers, students and partners shape, test and further develop sustainable innovations on campus. Another break-out session elaborated on the keynote speech of Jeroen Willemsen, raising the question how to transform our diet from animal proteins to plant based proteins. The last session used the plastic whale in the canal outside as a metaphoric ‘whale in the room’ to conclude that narratives are crucial in the transition to a sustainable world. And circular economy alone is not enough anymore. How should universities reinvent themselves? All this sustainable buzz came together during the concluding panel discussion. 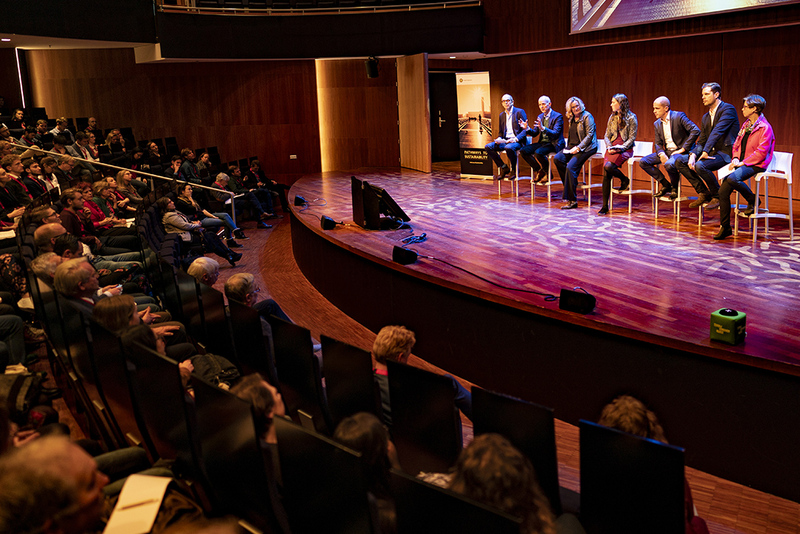 Moderated by Dr Vanessa Timmer and Prof Maarten Hajer, experts across the disciplines sat side by side to discuss how should universities reinvent themselves to advance sustainability? 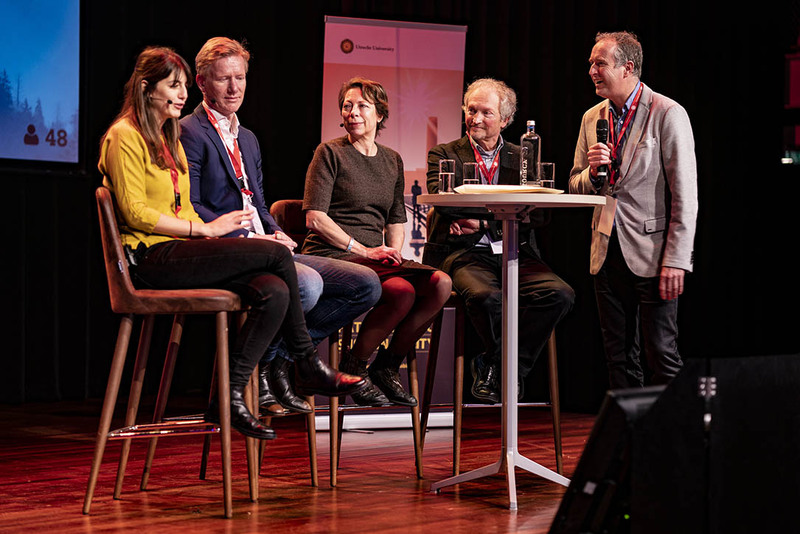 King’s College Professor Frans Berkhout, Water Law Professor Marleen van Rijswick, Diederik Samsom, Utrecht University honorary doctor Sybil Seitzinger, paleoceanographer Prof Appy Sluijs and the spirited Elizabeth Dirth came with pointed suggestions. The days of the scientific ivory tower are over, so much was clear. And although the participants differed on the ‘how’, they all recognised that we need to go outside and engage with the world. Through students, through civilians, through media or by connecting science with societal stakeholders and institutions. The panel discussion, however amazingly interesting, had to come to an end, and concluded the conference as well. Many participants stayed for a few drinks and some delightful snacks to have some final discussions. Many thanks to all the participants and organisation who made this conference possible. Watch the plenary morning programme on video. Below is the full video, followed by separate videos showing the individual parts of the morning programme. With an inspirational talk on the ‘Skyscraper whale’ artwork of plastic waste, Marleen van Rijswick, professor of European and Dutch Water Law, set the tone for the conference. Why is it so important to connect scientific rigor to societal relevance? And what does the university do itself to be sustainable? Rector Magnificus Prof Henk Kummeling opened the conference by zooming in on sustainability research and education at the university. Prof Maarten Hajer, Scientific Director of Pathways to Sustainability, looks back on the highlights of the programme of the last year and sets the agenda for the upcoming period. Johan Schot, professor of Global Comparative History, introduces keynote speaker Prof Sheila Jasanoff from Harvard Kennedy School. A pioneer in her field, Prof Sheila Jasanoff from Harvard Kennedy School calls for a new imaginary in the transition to sustainability. At the conference she gave a keynote lecture entitled ‘Unmodern imaginaries: infrastructures for a sustainable world’. Q&A with Prof Sheila Jasanoff about her keynote lecture ‘Unmodern imaginaries: infrastructures for a sustainable world’. How can we best urge consumers and producers to produce and consume more plant-based proteins? 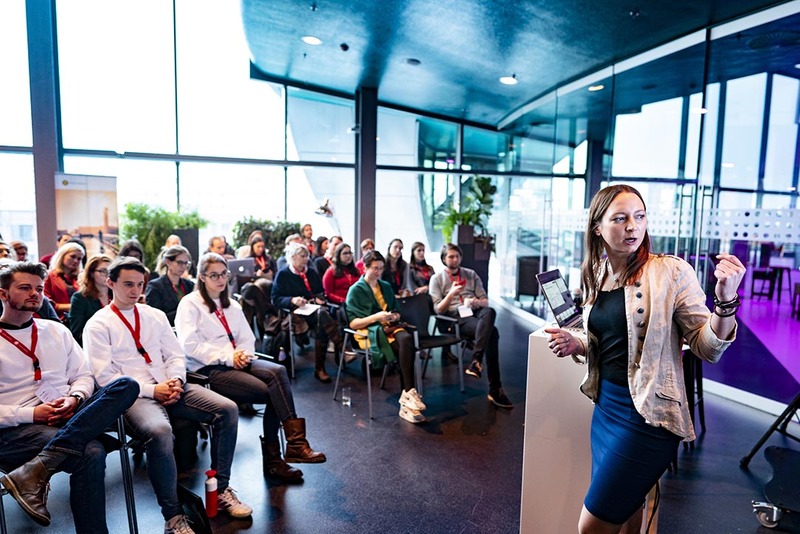 Jeroen Willemsen, founder of the Green Protein Alliance, held a motivational talk on ‘pathways to a more plant-based future’, followed by a reflection by Denise de Ridder, nudging expert and professor of psychology. How do we imagine our sustainable futures? 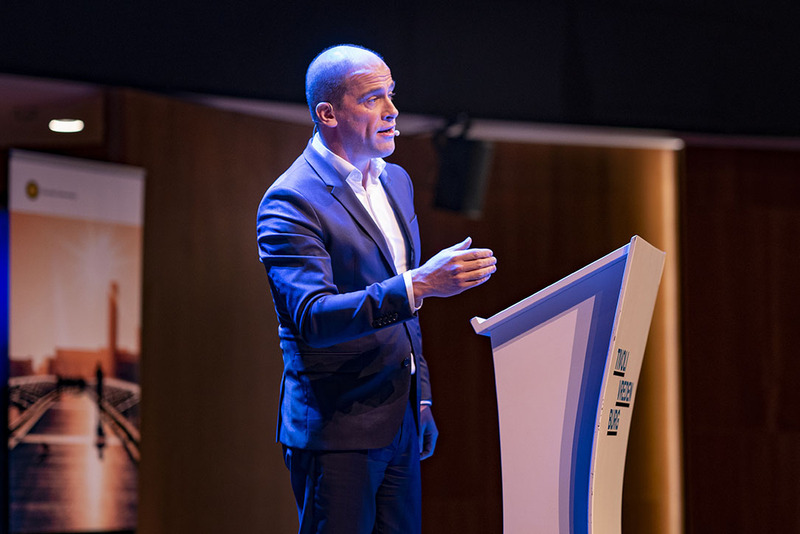 In an optimistic speech straight from the heart, Diederik Samsom dared to dream big. He used storytelling to take us on a journey to sustainable futures, based on his varied experience with sustainable energy in the energy sector, in Dutch politics, and at Greenpeace.